The UAP rack bolt set can be installed anywhere on a door, but usually most prefer it either at the top or on the top side of the door. 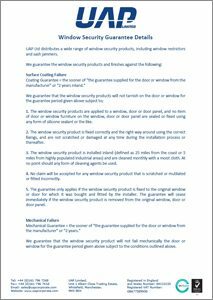 This makes it an ideal safety precaution if your customers have small children in the house and you want to protect them from leaving the home undetected. 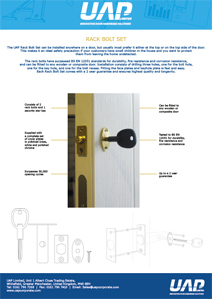 The high quality rack bolt has been tested for over 500,000 cycles and ensures longevity and added security to a front door. 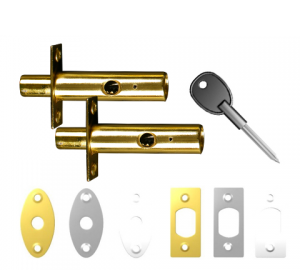 The UAP rack bolt set comes with all fitting screws, two rack bolts, a rack bolt key and a full set of oval and rectangle escutcheon plates in white, polished brass and polished chrome, to ensure that it matches your door hardware perfectly. 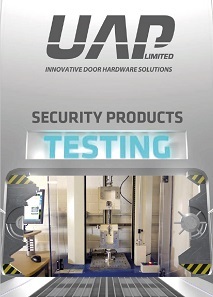 This machine tests the corrosion resistance of the rack bolt sets and many other products. The salt spray cabinet produces a corrosive environment, by releasing a dense saline fog into the chamber which the products are exposed to. This creates accelerated corrosion to the product and allows us to test how well the product would stand up in harsher environments.Rack bolt sets are tested to ASTM B117:2005 for 480 hours.